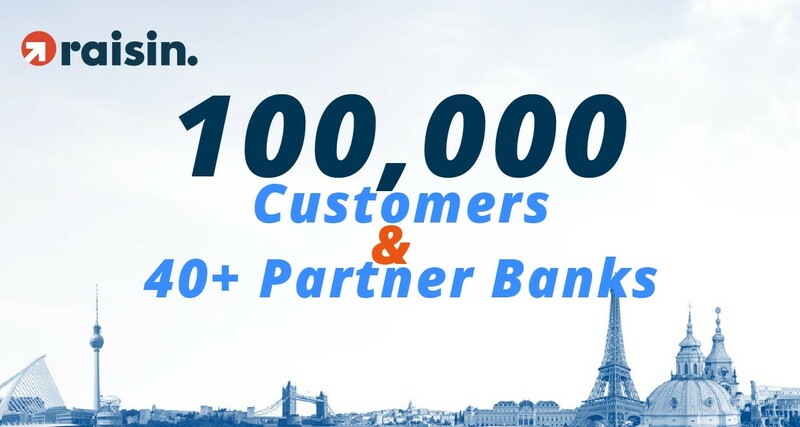 BERLIN – December 06th, 2017 – Shortly before the end of the year, Raisin has reached two further important milestones: The total number of customers has grown to 100,000 and, in addition, Raisin has integrated more than 40 partner banks from 18 European countries. Raisin continues to consolidate its position as the leading marketplace for investments in Europe with its two latest success stories after it was already able to announce milestones, such as total deposits of EUR 4 billion or one of the largest financing rounds of the year in the German Fintech segment this year. Since the launch of the German localized platform weltsparen.de just under four years ago, Raisin was able to win customers from a total of 32 countries with 129 different nationalities. This success was mainly driven by additional successful market entries in Austria, Spain and France as well as the launch of the pan-European platform raisin.com. Compared to the average deposit interest rates in the respective markets, customers have been able to earn an impressive EUR 35 million in excess interest up to the present day. The client’s investment success is also reflected in impressive satisfaction ratings: Raisin is rated by customers with a TrustScore of 9.2 out of 10 and a Net Promoter Score of 72. The majority of customers belong to the age group of 56 to 65 years, which also contribute a disproportionately large share of total customer deposits. The total amount of more than EUR 4 billion is invested for the most part in fixed-term deposits with maturities of up to two years. Since the launch of Raisin, female customers account for an ever-greater share: Within the last four years, the proportion of female savers has increased by 16 percent and currently accounts for around one-third of all customers. Another success story is the number of partner banks of Raisin which outperforms the competition. With solarisBank, Raisin just welcomed its newest partner bank, bringing the total number of banks to more than 40 and the number of investment offers to 170. Further interesting information on the customer base and partner banks of Raisin can be found in the following infographic.